linzlinzlinz: Give Nets. Save Lives: Part 2. Give Nets. Save Lives: Part 2. It's no secret the level of love I have for Twitter. I've mentioned that here a few times. I heard it referred to once as the 'great equalizer,' which sentiment I stand behind completely if used regularly and properly. We're in a day and age where you can build a community - where you no longer have to be famous, political, or have important connections. I use Twitter recreationally, mostly. It's always fascinated me to see what people - from everywhere - are talking about. About a week and a half ago I posted about a cool experience I had exchanging tweets with George, one of the guys featured in that crazy Discovery Channel show Jungle Gold. In short, I caught an episode of the show (it's on really late, folks) and ended up hopping online to learn more about their endeavors. A simple tweet I posted about watching their show turned into an immediate response from George, and some friendly banter about the show's intensity. After a restless and sleepless night (sleep is for suckers, I always say) I had a light-bulb moment. The gentlemen from Jungle Gold were from Utah - a fact that is really what drew my interest into the show in the first place -and not just from Utah, but from a place really close to me. Maybe they could help me with information or assistance on doing something charitable for the remote village in Ghana for the holiday season. In short - they obliged. And all via Twitter, I might add. And like I mentioned in my previous post, a handful of tweets turned into a few phone calls, and a brewing of ideas on what I could do. I didn't want to assume that I knew what they people of Ghana needed. Chatting with George, he mentioned the need for mosquito nets. I set up a fundraiser and decided that my focus this month - from December 1st to 24th, would be to raise money for the purchase of mosquito nets. George graciously agreed to return to Ghana in January with the nets we're able to purchase, and will pass them out to those in need. In the meantime, in a phone conversation on November 30th, he mentioned they were taking a quick trip to Ghana and would be returning before Christmas. Their date of departure was only 4 days away. I wanted to do something then. What could I do? What would make sense? What could make a difference? 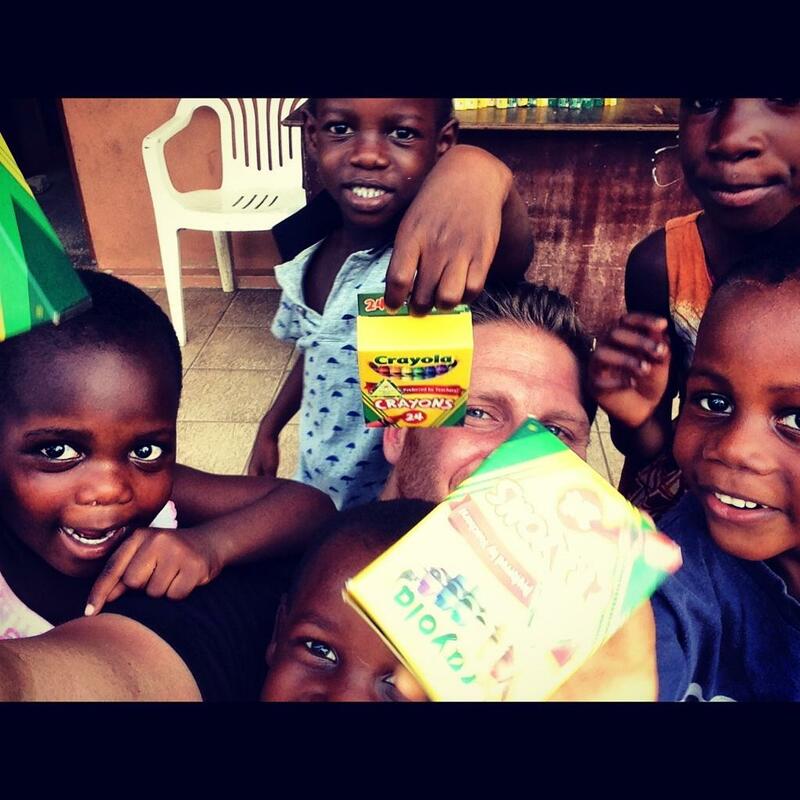 Inevitably my thoughts turned to the kids in Ghana. I decided that I'd like to send crayons. Small boxes of crayons. With about 4 days to gather 275 boxes, I turned to Facebook.... and guess what? Facebook delivered. Between myself, and my friends Emmie Watts, Julie Dayley, and Jonie Sumison,we gathered 315 boxes of crayons in just 3 days, which was a heartwarming experience in and of itself. Have you ever thought about how much 315 boxes of 24-count crayons would weigh? Yeah, me neither. I packed the crayons - all 95lbs of them - into two carry-on sized suitcases and delivered them to George. I was proud of the collection, but embarrassed that I hadn't really considered the extra weight, potential expense, and likely inconvenience of traveling to Africa with two extremely heavy extra bags. The bags were loaded, I was able to hear some cool stories about their experiences in Ghana, and the crayons were then on their way. I quickly teared up and said a little prayer of gratitude. What a cool opportunity. In just under a week I was able to connect with someone I'd never met before that happened to be heading to Africa, was able to collect over 300 boxes of crayons, and was able to receive a photo of some of the crayons being received in a land far far from home. And all of this - thanks to social media. Now do you see why I love it so much? It takes 'doing good' to a whole new level. Let's connect on Twitter, shall we? Follow me via @linzlinzlinz.... Oh, and don't forget to donate. You even earn one entry into a drawing for one of two $100 Visa gift cards, for every $5 you put toward this cause. Donate HERE.